The current active MLS listings in Crosswinds are shown below. 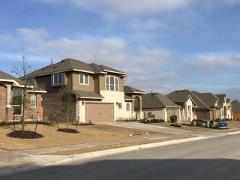 If you have a question, or would like to see this neighborhood and its homes, call Jim at 512.913.1557. NOTE: All of the listings may not map properly. Location: Crosswinds is located about mid-way between Kyle and Buda, Texas, on the east side of IH-35. Take exit #217 (Windy Hill Road) and travel east. The entrance to Crosswinds is on the right, just opposite the entrance to Shadow Creek. The table below shows an overview of home sale activity in Crosswinds in 2017-2018. A number of other homes have sold (not reported in the Austin MLS). Crosswinds Kyle real estate market data from the Austin Board of Realtors 1/1/2017 - 10/15/2018. 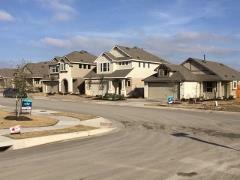 In its early stages, Crosswinds is a multi-featured, 3-builder community. The grand opening was held in May 2017. 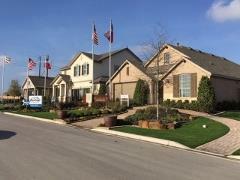 Model homes for Pacesetter Homes, Meritage Homes and Highlands Homes are open. Work on a new phase on homes on the south side of Crosswinds began in late 2018. Pacesetter Homes offers a number of single- and two-story plans from its Courtyard, Craftsman and Craftsman Plus Series. Base prices begin in the low $200s (1,188 sq. ft., 40' lots), and stretch up to the mid-$320s (3,117 sq. ft. on a 50' lot). Meritage Homes has 7 designs for today's buyers. Current inventory homes have base prices ranging from $239,990 (1,716 sq. ft.) to $269,990 (2,452 sq. ft., 2-story). Homes will be built on 50' lots. Highland Homes will offer homes on 50' ft. wide and 60' ft. wide lots, both out of its Artisan Series. Base prices in the begin in the $250s. 1- and 2-story choices homes are available in sizes from 1,610 to 2,965 sq. ft.
All of the homes in Crosswinds will be energy-efficient and will have many standard and customizable features. 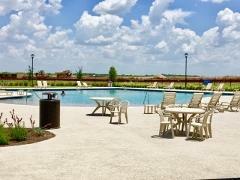 Crosswinds homeowners enjoy many community amenities. They are centered around the now-completed Windy Point Amenity Center, which includes swimming pool, splash area for kids, sport court, walking-bike trails, playground and more. 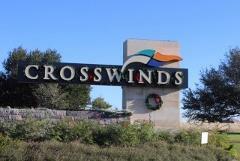 Membership in the HOA ($600 annually) is required for Crosswinds homeowners. Fees are used for upkeep of common areas. The primary taxing entities are the Crosswinds MUD, Hays County, and the Hays Consolidated ISD. There are no city taxes. Utilities for Crosswinds are provided by the Crosswinds MUD (waste/wastewater), Centerpoint Energy (natural gas), Pedernales (electricity), and Texas Disposal Systems (solid waste/recycle). Homeowners in Crosswinds have many local facilities they can visit for various needs. For shopping and entertainment, the Home Depot and EVO Entertainment complex are located just across IH-35 in the Kyle Town Centre. South from there are three popular and large retail developments with big-box stores and smaller businesses as well. These are the Kyle Marketplace, Kyle Crossing, and The Village at Kyle. Stores include HEB Plus, Target, WalMart SuperCenter & Lowe's. The Village at Kyle also is home to the Seton Medical Center Hays, which opened in late 2009. The Cabela's outdoors store and a number of other shopping centers and eating places are located just to the north in Buda. Crosswinds residents are also a short drive from the San Marcos area and its famous Tanger and Premium Outlet centers. The very popular Southpark Meadows retail shopping center is located just a few miles to the north in South Austin. Golfers can get in a round at Kyle's Plum Creek Golf Course. Nearby parks include the Lake Kyle Park and the Steeplechase Park. Crosswinds is in a great location for the family that wants or needs to live outside the Austin metro area. Residents have prime access to IH-35, the main artery between San Antonio and Austin. For those who would rather travel around Austin, the SH-130 toll road (connect at SH-45, also a toll road) or via US-71 East off IH-35) is a short distance north of Crosswinds. You can travel to ABIA (Austin Airport), Round Rock, Pflugerville or Georgetown and miss much of the traffic. Children living in Crosswinds go to schools operated by the Hays Consolidated Independent School District (HCISD). An on-site public school is planned for the community. Parents are encouraged to verify current school assignments with the Hays CISD since school attendance boundaries are sometimes redrawn.